This is one of the seasons of the year when hobby time is reduced due to higher priorities, gardening, yardwork, repairs and renovations and so on, so things are effectively stalled here. My room is only 1/2 back to rights, I need to sculpt new Faraway units before I can add them, I'm not quite sure what I want the games to look/feel like apart from the individual toy soldier part (ACW battle? Colonial skirmish? Franco-Prussian bloodbath? etc). To avoid complete stagnation, I decided to look and see what I can do in short bits of time to keep things going and maintain morale. I don't really NEED more Oberhilse troops at the moment, but I've had a Zinnbrigade marching Prussian for years now and had yet to vent his rifle and paint some up. Seemed as good a place to start as any. But what did the Oberhilse uniform of the day look like? I briefly considered various colours such as grey or blue and drab but decided that the traditional dark & light blue was still best. Grabbing the figures who had tested various drab or blue with drab uniforms last year I started experimenting. First up was the 1890's American dress uniform with white facing patches but something about it just looked too 1900 parade ground-ish. I flipped through books looking at various Italian, Austrian, South American and other countries who wore either dark/light blue combo's or spiked helmets. Switching gears I acknowledged that I would like to be able to include some ACW troops into the Oberhilse forces and that I would prefer something more 1860's-ish than 1880's-ish. I tried a plain ACW style blue sack coat with plain light blue trousers and black leather belts but the dressy helmet looked out of place. I then started playing with shapes and types of facings. The existing Blue Guards wear red facings and piping with slashed cuffs but red is supposed to be the Oberhilse artillery colour. It is just possible the the uniforms were originally meant for the Prussian army but the official story is that initially the artillery was the only regular forces maintained by Oberhilse and technically the Blue Guard was the artillery guard not the republican guard, Fusiliers in British terms. So light blue facings for line units and since facings and trousers looked plain, I added white piping. I also decided to see what a felt helmet would look like instead of leather, after all both British and US forces went this route with blue felt helmets. Soon the figure started to look right, a bit like an 1880's British toy soldier but in blue. I was curious about the possibilities of converting the spiked helmets to sun helmets so I lopped the spike off another figure and did him in white helmet and puttees. I liked the result but he definitely looks later, skirmish lines rather than closed ranks. He also looks more like a British artilleryman in Egypt than an Oberhilse soldier fighting Atlantican tribesmen. I picture the latter in slouch hats. So I'll tuck him away for future possibilities. So now I have 8 marching figures cast up, one under way as a sample, the rest waiting to be cleaned up and de-sprued. I still need to decide if I want to go more Little Wars-ish with long lines of riflemen taking cover or stay more ACW ish but I can press on with painting when I have a few minutes. I think I'll go with the black leather helmet though, just to keep them looking not too early or too British/American. The latter point is becoming important as I think it will be easier to make terrain if I'm not too concerned with getting a consistent 1860's North American look. Once I get my table up, it'll be time to test sub-eras. If, as looks likely, I end up with lots of breechloaders, I'll need to think about the effects and look closer at some sort of pinning rules and take a good look at timing of fire vs movement to make sure I capture the difficulties of moving forward under heavy fire. It may call for a change to reaction fire or be worked into pin rules. Under the Square Brigadier where a unit is a unit and there are no guarantees of getting any hits, I might rule that any hits pin a unit. 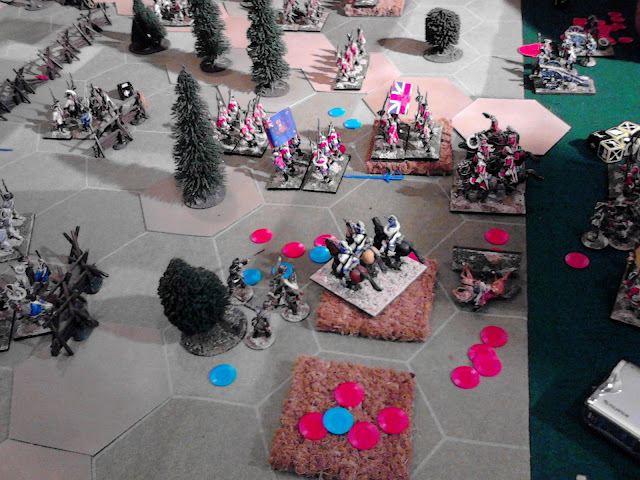 Units deployed as skirmishers and supports would still suffer 1/2 casualties but a single hit which is rounded down and dropped would still pin. A whole turn would be required to rally thus allowing the unit to be shot at before it moves again. Using Hearts of Tin where there are more stands and thus more dice and more hits, I might need to work on a basis of 1 hit per stand to pin or perhaps hits = morale will pin (2 for militia etc). In MacDuff 25% causes a unit to be shaken but it lifts automatically at the end of the turn. Either that needs to change or perhaps stopping and going prone when fired on needs to be put in as a reaction for some units. This question also affects the look and organization of the toys. 24 figures in 2 close order ranks is not going to look right for 1870 despite any claim that it represents skirmishers and supports, 12 in 1 rank for deployed troops might work, 2 ranks for close order or 3x4 for column..
Lastly a shout out to Henry Hyde for the June 2013 issue of Miniature Wargames with Battlegames, one of the top issues yet of either magazine (IMO), and to Bill Haggert for a great article on history and game design. There's more good stuff in the issue but I haven't finished reading yet! Bill's article is a response of sorts to my article in the last Battlegames and is spot on. Unfortunately, while people have picked up and commented on various points in my article, it seems like pretty well no-one noticed that my main point was intended to be about gamers being encouraged/allowed to explore the history themselves. Even I have trouble recognizing that when I go back and reread so it seems I need to revisit and practice my college writing skills before the next article. Luckily there is inspiration and encouragement to do it! A Little Something While I'm Waiting. My games room isn't quite back together again yet, I need to build a frame for my table which will now sit atop a series of non-contiguous book/scenery shelves, hang some pictures, put more stuff away, get rid of a lot more stuff and transfer my painting and modelling gear and organize it, but I needed a break. A game upstairs is still a week or two away so I grabbed a marker and some toys and headed downstairs. A minor border clash beyond the mountains in Northern Atlantica. Something to do with control of trading rights no doubt. Having decided to try to modify rather than replace my 3" gridded card table, I set about marking corner crosses without respect for the mottled squares. A thin brown marker would have been better but I didn't have one to hand and am sure I can soften the black crosses but they were certainly easier to see during the game.without detracting too much from the look. Given that board was not evenly divided by 4 in both directions, I ended up with the edge rows on 2 opposing sides being rectangles an inch deeper than wide. I figured this could be used to give a bit of extra depth when marching on but promptly forgot and marched on the other way. Now, while dealing with the shambles upstairs, I did find time to think about the next series of games and to reread a number of magazine articles and snippets of books, not to mention going back to the Game a Week reports (see at left) where I played Hearts of Tin on a small table. Time well wasted as they say. I decided that I wanted one of 2 things. One option is a traditional gridless wargame with very simple, intuitive rules, leaning rather Charge-ward. 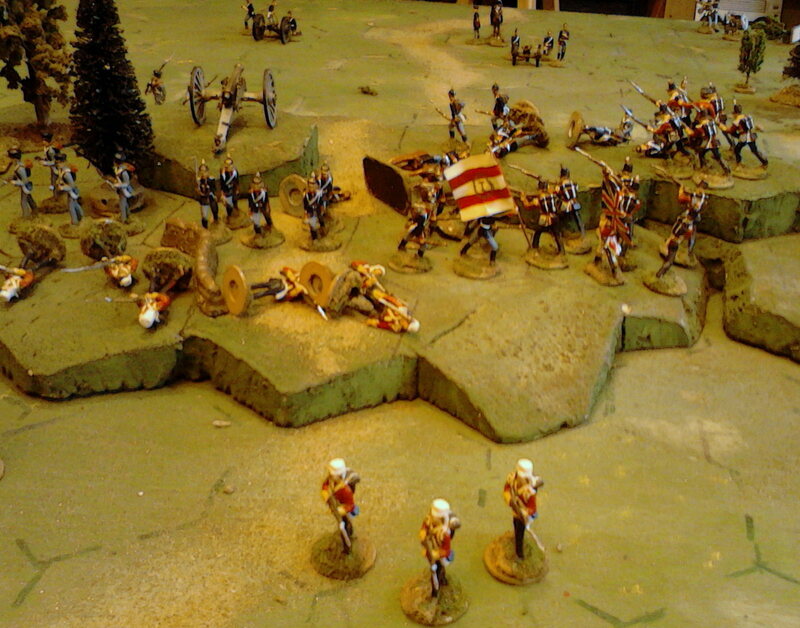 For the mid-19th Century I also wanted to make sure I had a "charge" option regardless of rules rather than just a close combat mechanism which meant in turn a chance of stopping it and a resolution all without a separate morale roll. I played about with some ideas which started looking more and more MacDuff like and then decided to drop it until the table was useable. The second option was to take another go at a square gridded game tipping the hat more to Battlecry without the cards. If I had the dice I might have considered using them but I don't see the need to spend the money when there are other options. After considering a wide variety of options, I settled on something that is closer to the original Hearts of Tin than I realized until I tried it. Essentially I made 6 figure "companies" and treated them like a stand which had X dice and could take Y casualties. I was going to go with 4 man companies as in the old days and allow 2 per area and I may try that but tonight I opted for the 6 man units with 2 dice when shooting and able to take 4 hits. This just happens to be 1/2 of the proposed 12 man units for a non-gridded game. Movement was 2 squares if deployed, 3 in march column. Range was 2 squares. For the charges I went back to making the side with the most hits retreat. Following on from previous experiments I decided to drop the diagonal movement and ranges. The main reason was to prevent movement between 2 impassible squares and to reduce the arc of fire. My argument is that Pythagoras failed to account for the linear nature of horse and musket warfare and that in order to move on the diagonal a unit would have to wheel thus taking extra time. Laying out larger units of figures on larger squares last week made this very obvious, the only way for a unit to move into the diagonally adjacent square was to march through one or both of the orthogonally adjacent squares. When firing, a battalion in line can't fire obliquely sufficiently to hit something way off on the diagonal so they would have to wheel anyway, running over into another square or backing to the middle and thus extending the distance. Anyway, I want a distinct "game" feel to this solo project so was going to use the Orders dice or Pips but having also thought about real life orders, etc, having been browsing passages from some memoirs I haven't reread in a while, and keeping in mind that this will be about skirmishes not battles, it didn't make as much sense as it does when ordering Regiments and Brigades so I opted for the initiative roll and a beyond command distance roll for detached units. I will have to go back and try tthe Pips though. One of the things I did change which won't work properly with the Pips, is that rather than the integrated firing and movement of the former, I reverted to a system I haven't used much in years, A moves and declares charges, B moves and declares charges, both sides shoot/react, resolve melees. This feels much closer to the old simultaneous move games and worked well. Oh, just occurred to me I could double up and use the same to determine Initiative and the number of orders available. For the charges, I reverted to an old abandoned HofT rule whereby the side suffering the most hits will retreat. 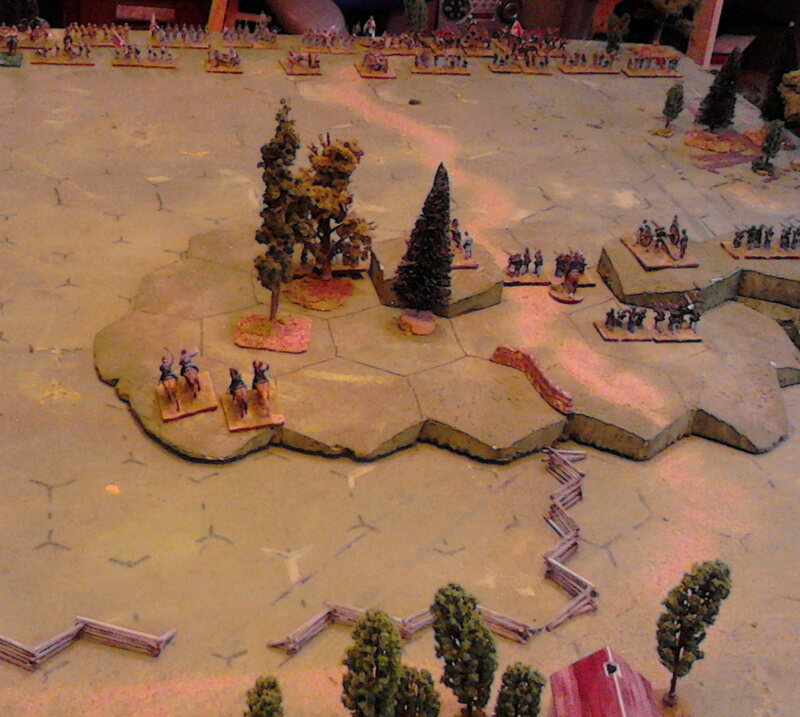 A clash of cavalry early on left Red slightly ahead and they used that and their early concentration to develop a distinct lead despite unfriendly dice. Soon Blue was.on the ropes with 2 units destroyed and 3 only 1 hit away from destruction and only 1 objective. Red had 2 units 1 hit away from destruction but none destroyed and they controlled 2 objectives. I probably should have called it then but thanks to some manifestly biased dice, a few turn later Red had 2 units destroyed and 2 more 1 hit away and no leader as Blue finally lost their 3rd unit. If I counted leaders as units it was technically a draw, if not then a slim win for red but it kept me engrossed for an hour so was a win for me. The larger squares on the small table were a much better fit for the 40mm figures and will hold most of the scenery I use with the 40's and had enough room to maneuver so that was a good call. I should be able to double or even triple the number of units/companies used in this game. Its possible that I'll play a different style of game on the main table but if I apply the same size grid as planned, I could use the same armies and rules in both places but with bigger forces upstairs, scenarios with 3 company regiments for each scenario unit.I'll also be able to use the same scenery for both boards so can now push ahead with doing some specific buildings as well as hills cut to fit the grid. Well, there I was contemplating table size and room layout again and being particularly unhappy that something in the current layout was making it hard to get around the room and even harder to keep it tidy and organized and that my current painting set up was so uncomfortable that I have been sort of avoiding it. Then some domestic requirements dragged me off elsewhere only to return with my old roll top desk following behind me. It not a big antique only a small, cheap, finish it yourself one bought when I got my first apartment back in '77 but still not what I would have selected to make my room less cluttered. Now, 1/2 way through the process, my table is in pieces and the room a shambles as virtually every piece of furniture in it is juggled and adapted. However, there has at least been some more planning progress. Firstly while the idea of 6" squares subdivided into 3" ones appears to offer the possibility of gridded games using conventional 40 mm units as well the possibility of a quadruple sized gridded game, in reality the grid added little to nothing to the conventional units and there is a lot to be said for using a 4" grid so as to maintain compatibility of basing with the only friend I regularly game with using a grid, albeit a hex one. So 4" squares it will be and I can proceed with measuring and cutting hills and painting the whole lot to match. That by itself will make life easier. Pity about the nice 3" board I made, I'll leave it for now but its going to have to conform so that I can double use terrain pieces. Hopefully I can swing that without ruining it. Anway, having looked at lots of past games, I have accepted that my 1812 stuff is the way I want it and that it still has room to grow and that the 1830's/40's stuff including skirmishes with rebels, pirates and indians, is what it is. I still have a craving to do something different and to paint more glossy toy soldiers and some in more of a classic toy soldier uniform (for me that's Guards in bearskins, Highlanders in bonnets and Fort Henry Guard). The revelation is that since I'm already filling the table with a mix of 1812 and 1840 troops, I don't really need to combine the new figures with the 1840's guys or even be compatible. So the late 1860's are back on the menu. Will it be 12 man battalions and conventional rules? 4 man units on a grid? Who knows?! It'll be red vs blue battles and snider-enfield breechloaders though. I wonder if Oberhilse adopted red trousers in the 1860's or raised any zouave units? OK back to work for me, There are book cases to be moved. A potentially lengthy task if the books keep opening up. I'll leave you with this video clip of 1870 Faraway forces playing the part of the Fort Henry Guard. My apology if this is a rerun which I suspect it is..
Its a bit late now as it has almost passed but this is Victoria Day in Canada, originally a celebration on the young Queen Victoria's birthday but now a fixed long weekend in May ostensibly to honour the birthday of the reigning monarch, or in Quebec, to honour the Patriotes of the 1837 Rebellion but really a celebration of the coming of summer. I don't have a Queen Victoria but here are 2 archive shots in honour of the day. The Red Queen sees her troops march off on their way to the front. Possibly to face a band of patriotic rebels? Well, we're here, wherever here is. The scenario stresses that speed is of the essence for the pursuing army and the Order dice were not kind to the Blue General. It was a long shot for an assault by 2 heavy and 2 light cavalry units to break the enemy line on their own but the Blue Dragoons came perilously close to succeeding. Note the dead Fusiliers and Brigadier on the Western shoulder of the pass and the rallying remainder beside the cavalry. Luckily the Green Tigers hasty square held. From an enjoyment POV this was a successful and fun solo game. From a "looking for the way forward" it was a bit of a wash leaving as many questions as it answered. It certainly wasn't what I meant to play when I started this exercise. Essentially this turned out to be a Hearts of Tin game with single figures on a big grid rather than groups of multi-figure stands and a Hearts of Tin game is what it felt like. There was at most a slight whiff of a portable game when negotiating around the diagonal question but that was it. A few stats. The units were composed of 12 infantry, 6 light infantry, 6 cavalry or 2 guns with 8 gunners giving something like 180 figures on the table. 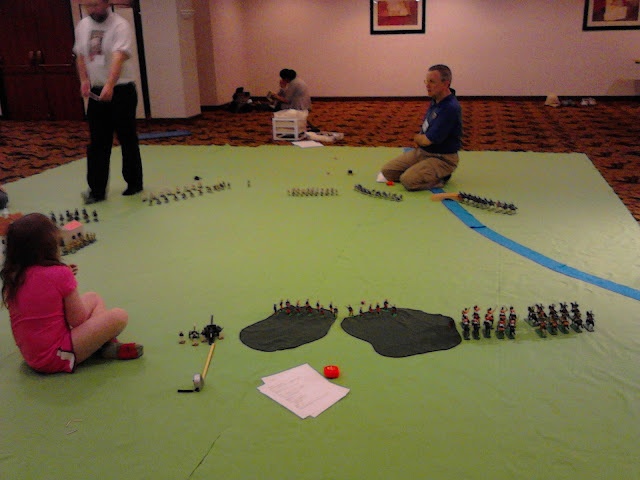 The game was fought in about 8 sessions over 2 days totalling about 3 hours. 16 out of a possible 18 turns were played. This matches the norm for a MacDuff or an older Hearts of Tin game though the figure count was perhaps lower than some of the more recent, overcrowded games. All of this seems to support that the grid did not detract from the game. The only advantage of the grid seems to have been that it was easier to transfer the layout to the table and I didn't have to constantly circle the table looking for at least one of the 1/2 dozen measuring devices in play. That is probably enough to justify continuing with it and finally getting the hills cut and hills and table painted to match each other. Once the 2nd Dragoons were destroyed and the Frontier Light Horse mauled, it seemed best to pull back the cavalry and concentrate on deploying the infantry and guns for a co-ordinated assault. The Brigade moves were essential for this. The Queen's troops took the opportunity to re-occupy the Western shoulder and adjust their lines. Looking back at the questions from last week, the answer to the grid is still yes and 150 -200 figures seems to be enough for me now when it comes to 40mm single figures anyway although I might double that for 1/72nd figures on multi-figure bases. Again the number of scenario units works well in game terms and the resilience in the rules used was just right. I'm still a little unsure about units, historical levels and how command control is handled for historical refights but more on that later. Since time was supposed to be of the essence, I was unsure how many turns to allow but decided that brushing aside the rearguard within 12 turns would be a definite Blue victory while holding for 18 would be a clear Red victory. At 14 turns it looked like Red might just do it. All of their units were battered but only 1 of the original 7 had been routed or destroyed and Blue's units seemed to be in disarray and out of position. The orders finally started to flow however and Blue took some tough decisions to slow down and prepare the final assault despite heavy casualties from fire. 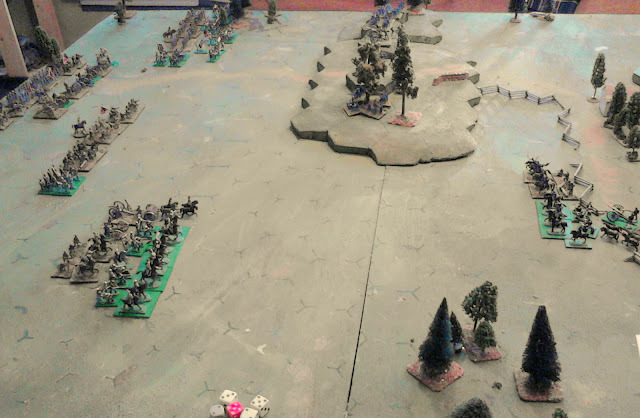 Fortune favoured the plan and on turn 16 an assault by the Blue Guards on one flank and the 1st Dragoons on the other cracked Red's force with the General going down and three units being destroyed or routed off table. Given the late hour, Blue's heavy losses and the small number of men in position to continue the pursuit, it was a marginal victory at best. Still, after the last 3 defeats, the next game might have to involve a fortified Red position under siege! One of the unanswered questions was just what was the actual size of this game? The units were treated as battalions and ranges reflected a scale of 150 yards per square, the same as HofT. Should it perhaps have been more like 50 yards with units being double companies? How would that change in ranges and command levels have felt? In most Napoleonic or ACW campaigns, an action between a handful of battalions would barely rate a foot note but during the War of 1812 on the Canadian frontier, an engagement with this many troops would have been a major battle and was similar in size to Grant's first independent battle at Belmont. Its all about context. The traditional approach has usually been to fudge it once the rules are written and for a one-off non-historical game, it doesn't really matter but for campaigns and historical refights, it's something to think about. This immediately brings up another issue that I have been fumbling with for years. The sort of might-have-been, Canadian/British vs US, mid-19thC, scuffles that were the original basis behind the now fully fictional Oberhilse & Faraway setting end up being very similar to the War of 1812 even allowing for slight advances in technology and an increase in populations and development of roads etc. If I am to now indulge a long held interest in painting late 19thC Canadian militia toy soldiers, can I sustain doing the same thing yet again at the same force level and style of game or do I need to break the mold and do something very different? It was my intent to do the latter but the danger is of trying to be different for the sake of being different. The idea I had was to do a small Battlecry/Portable Wargame type game with say a dozen 4 figure "units" on each side. A simple project needing barely 100 figures but should the units be companies for skirmishes and teasers or battalions for the same old same old, or perhaps brigades in a new mega game? If I were going to buy the figures, some version of this small game would be a VERY attractive prospect but I have been promising myself that THIS year, I will finally try out my poor neglected spin caster. I don't really nethe units ed a spin caster to produce perhaps a dozen or less of each new figure, so, there is actually incentive to try and find a use for several hundred new figures. If the Little Britain's looked more Britain's-ish and less germanic I'd be tempted to just sell the darn thing and go the easy route but at the same time the prospect of getting back to some sculpting and casting is enticing. So if I'm going to do more 150+ figure armies how do I make the games different? Try again to experiment with skirmish games perhaps? Something to revisit. Lastly and briefly, the Command Control issue is still on my brain, especially for solo games. The only systems that come even remotely close to the real thing are ones where player generals with limited knowledge write orders to subordinate players who in turn write orders for their troops and even those systems seldom deal effectively with the questions of how and why reserves were used. Well, limited info for both sides of a solo game really requires some form of AI to avoid turning rational acts into random ones, so I'll let it slide. The order dice combined with group moves and an ADC as used in Hearts of Tin is still one of the best systems I've used. In this game it nicely reflected the scenarios description of a disorganized pursuit with the General having to balance the need for speed with the efficiency of good order. Please note that comment moderation is in use. Anonymous comments containing links will be sent to spam. A Glimpse of What's Been Happening in the Square. 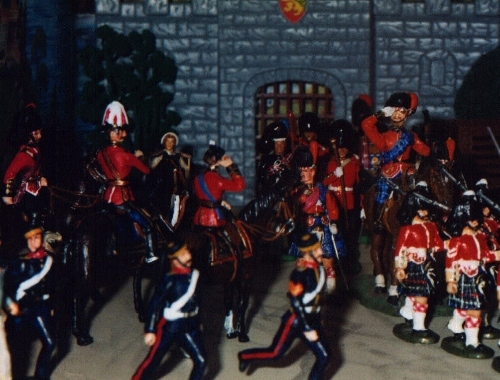 The Queen's troops form a rearguard to hold off Oberhilse's victorious forces. Its a little hard to see the corner crosses of 6" grid marked onto the canvas sheet but a desperate test game has been played through to a conclusion on Turn 16 of a potentially 18 turn game. More in a day or so. A MacDuff game with 8 x 16 man battalions + 4 guns, 1 Lt Inf, 3 cavalry all in 4 brigades. Its been a busy week non-hobby wise but whenever I've had a moment and able to keep my eyes open, I've been slipping upstairs and exploring what's ahead in wargaming terms for my mid-19thC toy soldiers. (I've also been poking my head into dark corners looking for my camera, sighhh .... ) Only the final game got played all the way through but I did enjoy some aspects of all of them even once I identified various issues. The tests were practical ones but the questions were part practical, part theoretical, if not downright philosophical. a) Do I still wish to pursue a gridded game. b) How many figures is enough and how many are too many? c) How many units are enough and how many are too many? d) Is it better to have a few resilient units that need more thought on how they are handled or a large number of ones that are individually disposable with the focus being on groups of them? e) What level of historical action do I want to represent with the toy soldier games? f) Does the command & control feel appropriate for the each of the various levels I try and what would need to change if it doesn't. 1/72nd modified Square Brigadier game with 4 infantry brigades each of 4 regiments plus a cavalry brigade and 4 batteries vs a slightly smaller force with similar organization. While clearing away the first ACW game, the one which stopped when I decided I didn't feel like digging out and using more marker dice, it occurred to me that since many of the volunteers who showed up last year were on smaller bases or had come off their bases, some rebasing was in order no matter what I did. I'm also sure that there are already more painted figures now than I could squeeze onto my table with my current 4 man bases. It also occurred to me that I could squeeze 4 of my stands into one hex. So I reset with 23 units representing about 9,000 men with 24 guns vs a slightly smaller defending force. I started with a Battlecry variant and switched to a Hearts of Tin/Square brigadier Blend. The result worked as a game but I was having trouble rating it for historical feel since I'm not sufficiently familiar with enough ACW actions of that size but I had a vague feeling that the gap between deciding to do something and doing it was too short, that there was too much control of units in close proximity to the enemy and that units didn't last long enough. That said, some aspects like the value of supports and the difficulty of controlling a broken battle line felt right. Once I felt that the game was working but needed an hour or more to finish and also recognized that I was in danger of confusing the 1/72nd ACW and mid-19thC Toy Soldier games, I stopped and packed up the ACW. In its place I laid out a MacDuff game. Technically this was 16 x 8 man companies on the attack but it was basically 8 x 16 man units. Oddly, just like the last couple of times I tried this, the rules worked OK but there just wasn't enough room on the table to maneuver and it became a bit of a roll up and roll dice game which doesn't interest me at all. It also happens to be bigger than most probably actions were I to ever want to do a Fenian Raid or Metis rebellion "what if" game. Including the light infantry this was 3 Brigades each of 3 battalions or about the size of some of the smaller Sikh & Mutiny battles. I did think about resetting with just 8x8 man companies but I didn't think that the use of rifles would make it sufficiently different from the War of 1812 to be worth trying. For the last game I went back to the Square Brigadier/Hearts of Tin blend using the scenario order of battle, counting 2 guns as a "unit" and without worrying what a "unit" was. Hit points/morale were taken from The Square Brigadier but I used 6 infantry, 4 light infantry or 3 cavalry counting the front rank of infantry as a single hit/morale point. The result was a very engaging game, I just was not sure exactly what it represented. Oddly, thats the sort of feeling I get from Battlecry, I have fun, it feels somehow right but at the same time, I can't quite relate it to reality. Kinda like a game of Toy Soldiers now that I think of it and that was kinda the idea for this year. In any event, it took 5 sessions over 2 days but I played all the way through, something like 12 turns, maybe a few more and perhaps an hour and a 1/2, longer including just looking at or thinking about the game. About 1/2 way through the final game. I don't have definitive answers to all of my questions but I do have some preliminary ones. a) Yes, I don't need a grid but I find it convenient, especially when I'm tired. b) Numbers depend on the figure size but if I use 1 unit per scenario unit then about a 3" to 6" frontage per unit works in my table. 6 x 40mm toy soldiers seems to work and is convenient with the current rules but 8 works space wise and remains consistent with MacDuff for cross over purposesl. 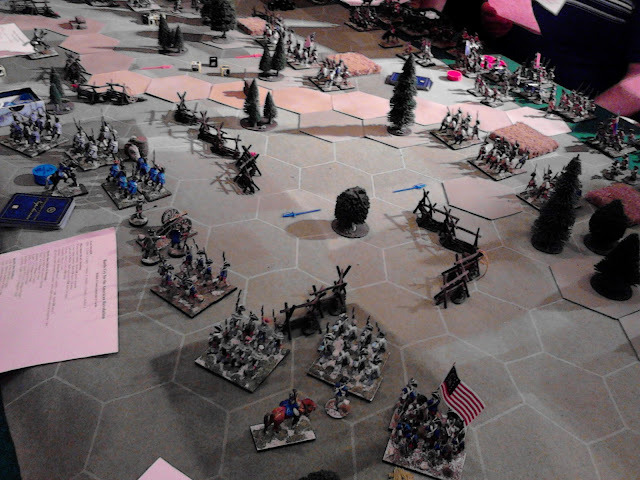 c) Using wargame forces of the size in the Grant & Asquith scenarios seems to work well for an evening game. d) I think its most satisfying to have fewer, identifiable units than a faceless mass but this means they need to be resilient or the game will be over in a flash. e) Having stopped to browse a dozen ACW, Crimean and Sikh War/Indian Mutiny games, the big battles really need a different treatment on my table and I'm not sure that the sort of decisions made by then historical commanders are the sorts of ones that I want to be making,. Despite the occasional desire to be a Big General, I think I'm happier in the traditional mini game, closer to the powder. Small battles, raids and ambuscades. f) in part the C&C issues relate to actions corps sized or larger. That said I am thinking of a few twists to reward leaving a reserve as a reserve until its time to commit it. This might take the form of something like a double move when a designated reserve is committed or a ban on group moves when close to the enemy or something else or maybe just a system with longer moves but also multi-turn combat resolution. One thing I didn't check out is whether or not this sort of gridded set up will provide a fun game with forces 1/2 this size. Based on some of the card table games, it should. Another issue is how many grid squares do I need and how big is too big? I think the next step is to lay out 5" squares on the canvas cloth and try that out. I'm happy with the over all feel of the rules but I have some decisions to make on things like "1/2 hits in cover or cover lets a unit cancel 1 hit". I have however decided to back out of the universal set and do a couple of cleaner variations on a the theme to start with, using the same basic construct but with only the appropriate troop types, factors and tactics and not necessarily in scale with each other. Initially these will be a revised Gathering of Hosts for Ancients and the Square Brigadier for mid 19thC. Others will probably follow. The Blue Guard supported by the remaining elements of the first wave, storms the hill rolling 3 x 5's and 6's to break Red's morale and take the ridge. "Rebs Sir! Thousands of 'em"
I was laying out a scenario for an 1860's game when I remembered that I had 2 1860's armies that could use an airing. This is an old chestnut of a scenario which lets me take scenario design out of the analysis and also just happens to be a scenario that puts me in mind of a certain ACW battle which started with a force holding a ridge against a larger force until reinforcements arrive. The similarity ends there but its enough. The original plan was to try out the square brigadier straight up as written but after Chris's AWI game at Huzzah, I had Battlecry on the brain so decided to basically use that combat system with Pips instead of cards. The first few turns flew by despite there being in excess of 30 units on the table but it didn't take long before I called a halt and reset. For reasons that I will avoid going into, I rearranged the originally planned Brigades of 4 regiments each of 2 stands into Divisions of 4 or 6 two-stand "units" with Pips being rolled at Division level. This led to really ragged advances, and with so many dice having such a big effect, felt a bit "snakes & ladders" -ish. Worse, with 4 hits per unit but 2 stands, I quickly ran out of hit markers and realized that I might need close to 30 if units didn't die quick enough. The whole feel was wrong too, not enough planning and too much reaction for a Corps level action, not enough meat for a Division level one. It would have been better with an opponent but what seemed to work OK as a small, casual solo game wasn't working for a large one. Too much work to set up and play for too little reward. I reset the game, extended moves, restored the Hearts of Tin idea of only rolling for the Division or higher general for Pips but moving a whole formed Brigade on 1 Pip and that worked fine. It was possible to form a plan and keep it more or less going if you focussed and the enemy didn't interfere. I also went for stand removal to avoid markers but as soon as we got within range it was obvious that I didn't have enough stands on the table to give the game depth. The clock had run out on my play time anyway so I let things be. So, next game will be single 40mm toy soldiers on the same terrain to try out that plan. In the meantime, if anyone can tell me where I stashed my camera before heading off to Huzzah, I'd greatly appreciate it! Sighhh I might as well have taken it with me and not worried about losing it on the road! I barely got started on the possibilities when I remembered that I had sorted all this out in December. However, persevering with "research", I managed to fit in viewings of the Charges of the Light Brigade over the last 2 days. The more I see the 1968 version, the more I dislike it as a film, I may not fundamentally disagree with many aspects of the extended diatribe against the English class system but when oversimplification mixes with selective facts and getting things wrong, crossed with one dimensional characters, minimal plot and lack of drama, well it may be a favorite movie of many but its not one of mine. The 1936 Errol Flynn version on the other hand gets better each time I watch it. At least the factual errors stem from plot demands not socio-political agenda. I'm amazed at how well some of these 1930's films capture the feel of 19thC military life. Presumably there were enough retired cavalry officers and the like about to act as advisors. Of course things tend to get away during a cavalry charge but that will happen. The job on uniforms is great, especially in India. There are some minor gaffs such as the sepoys which have appropriate coatees but post-mutiny turbans and light dragoons wearing 1855 tunics in 1854 and the sentry in the pre 1842 shako but that's pretty picky. Interesting that in the combat scenes shooters are seen placing new percussion caps but only one is ever shown ramming. I presume that was for convenience and safety. Into the valley of dice. Anyway, the movie confirmed that my liking for the 1850's and 60's runs deep and that was what I had originally planned for my recast Britain's (Crimea & Indian Mutiny to Fenian Raids) and settled on last December. I also confirmed that while I like the NW Frontier and Mutiny I have lost the urge to "do" India. The enemy in the pass or attacking the fort could just as easily be Mexicans, Assiniboine or Atlanticans. That still leaves the question of how to design a game involving small armies on a big space on a 5x6 or 5x7 table. This will have to be resolved before any future attempt at a Boer War game. Something on the order of 250 yds to a 4" hex and 30 minute turns I should think. But first, I need more Atlantican natives to fight Faraway's existing troops under existing rules and regulations. Work to start on some more of these tonight. Having returned re-invigorated, I was going to do a major review but it didn't take long to realize that the main thrust was "steady as she goes" so I'll leave that for now, maybe I'll pick it up for this year's July New Year's post. More immediately, the 40mm War of 1812 is here for the foreseeable future but while there are things to do, I'm going to put it away. I'm NOT going to start my own F&IW collection but of course there are many Indians, Canadiens, American Militia and Highlanders from my Acadian War of Independence games that will fit in to the currently proposed Huzzah 2014 F&IW game. More on that later but there are 10 Sash & Saber Indians that didn't get their warpaint finished in time for Huzzah so I should take care of them before they go stale and end up rotting in the 1/2 painted queue. There's lots else in the queue but I want to do some more toy soldiers that look like toy soldiers so that's next. I'm just not 100% sure what I want to do with them, something I realized when I went onto the Spencer Smith site to order a 40mm sized 4.7" and friends to go with it. Do I want to do 1899? in what fashion, 1860? steady as she goes with 1842? hmmmmm OK a little bit of thought on this one. Since 1812 -1837 is cruising smoothly, maybe this is the time to jump to breechloaders or at least Minie rifles. Should I give in to the temptation to carry on with MacDuff in a different era? Or, should I perhaps go a different route with the later toys and build for the Square Brigadier? Needs some thought and....and..... aha! ...Some test games! 1865: MacDuff vs the Brigadier! When Ross Mac comes marching home again, Huzzah! Huzzah! 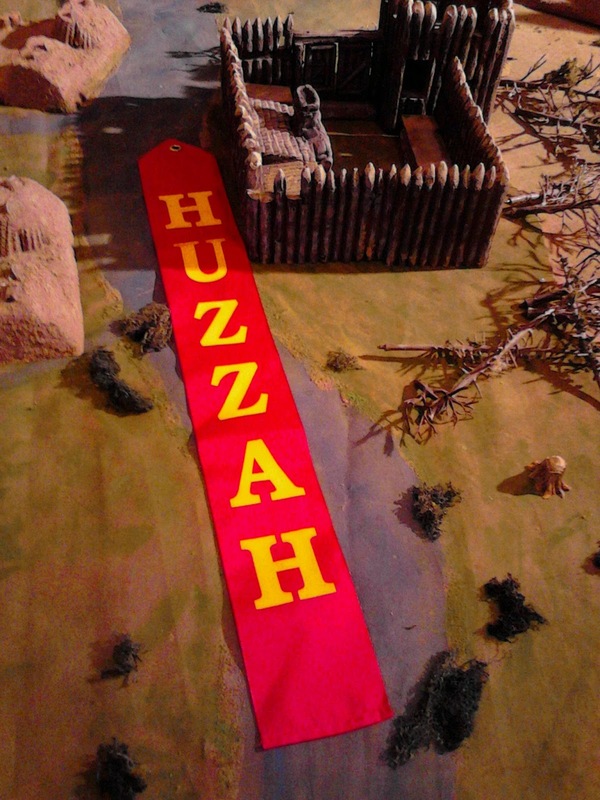 Well, Huzzah is over for another year. There are two bright sides to this, firstly the date for next year has been announced and it looks like I have no scheduling issues so plans are already afoot for next year, and secondly, I was starting to feel a bit jaded last month but am now restored to enthusiasm for the hobby. I will deal with plans for this year in a future post but here's a brief look at my Huzzah weekend. 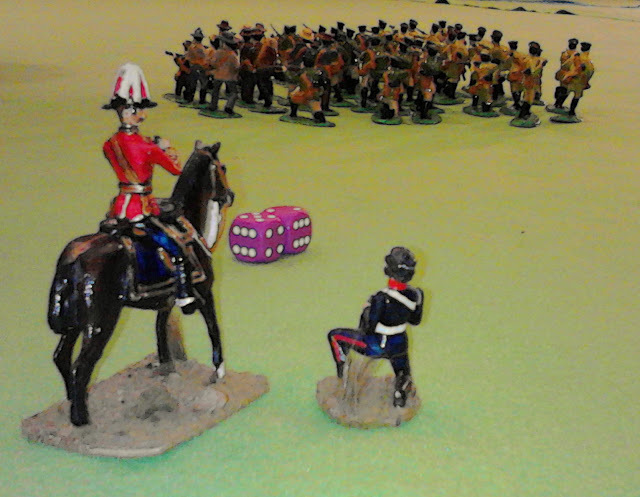 General W. Britain and Major Stuart came along as observers to the Funny Little Wars game. It was roughly 500 km each way, I could probably have driven straight through, taking about 11 hours, but I stopped for the night to visit my sister and our niece who, rather conveniently, live on an old farm roughly 1/2 way. My sister was not only nice enough to also put up Jeff, my friend and fellow gamer, but she even slaughtered one of her kids to make supper. Ok that's not strictly true, Dorothy was a young adult goat when slaughtered and that was some time ago. The journey continued on Friday and we arrived in Portland mid afternoon (thanks to the time change from Atlantic to Eastern Time Zones), time enough for me to sell off some old books to Dean Emmerson and meet up with Rob Dean (see Sharp End of the Brush) and go for supper before our 7 pm game, abandoning Jeff to set up his 15mm Austerlitz game on his own, mostly. Unfortunately, I have no pictures of the game or the playtest we did last week. 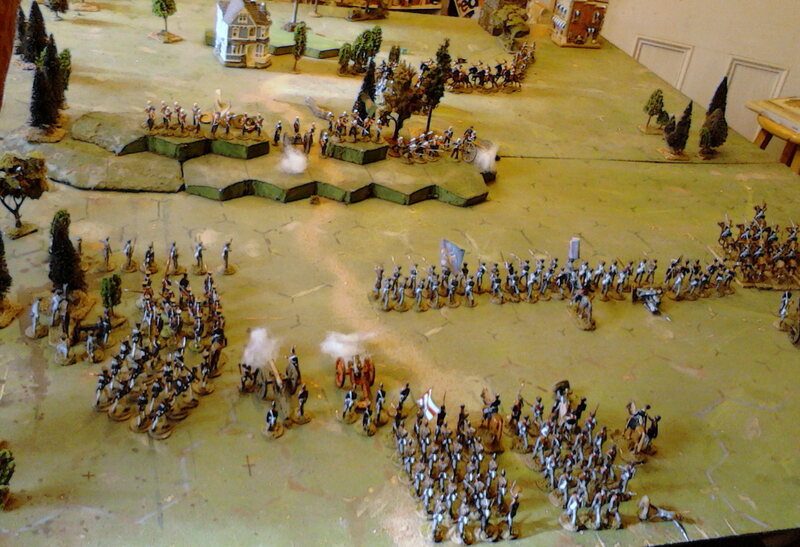 The rest of Friday was taken up with Chris Parker's 40mm AWI game based on Guilford Courthouse. The rules were based on Battle Cry with lots of modifications. Since I've playing similar games here I was quite interested in swapping ideas. I think I had the better of the deal, or will have if I can convince Ron. Under the small world heading, Rob, Ross and Ray formed the American command. In the course of some off topic chit chat we discovered that Ray often visited Fredericton and knew my niece and my brother. It was a close fought game, the British won the first round despite, if not because of, my chewing up the British left, but the American's managed to pull out a draw by the end so all was well. It was one of those typical Battle Cry squeakers of a finish and put me in the right mood to go off with Sam Adams and Rob for more chat about life and wargames projects. .
Chris Parker of Day of Battle Games ran this 40mm Guilford Courthouse game using a Battlecry variant. The Red and Blue poker chits are a record of where units took hits. I know that some Nova Scotia gamers might find this hard to believe but after a bloody see saw battle in the wheat field, those Blue dots are my casualties while the piles of Red chits represent most of the British units entrusted to our very own Gary. Saturday morning I decided to lay low, see the sights, chat and go table shopping. Gosh those Eureka Miniatures are beautiful! Almost broke down and laid aside the "no 28mm" rule. But I persevered and only bought a handful of 40mm Trident AWI to add to the existing collection, mostly civilian types inc a milkmaid a milking, Laura Secord in some future 1812 game no doubt. And 1 book Barnes History and Uniforms of the British Cavalry 1066 to 1945. A companion to his books on British and Scottish Regiments which I've had since my teens. Saturday afternoon was Funny Little Wars hosted by Dr. Mike Fisher (see his blog). I was surprised not to see more players there but 5 of us were enough to manage under Mike's guidance. Bottom line, my clever plan to mislead the enemy, amuse his forces with my cavalry, seize the town then double back and take the bridge. This almost turned into, let Rob shoot down all my cavalry while the enemy storms the town but Rob settled for lobbing shells well over the heads of my cavalry while they skedaddled and only rifled a few and Dean stoutly drove off the enemy and secured the town. A counter attack by the enemy cavalry was driven off but a follow up by my cavalry merely added to the toll when Rob's rifle dice suddenly averaged out. So there we were at the end if the day, lots of dead and wounded and one objective each. A little more terrain might have allowed for a more subtle attack plan but good fun was had which was the point really. Rob in blue anticipates my plan (rats). In pink is Major Natalie in charge of our artillery. I hadn't seen any 4.7" guns in Mike's Arsenal so I brought along one and a Naval crew of Soldierpac recasts, just to be sure. Here they were preparing for the first time to fire in earnest against an unknown foe. Major Natalie fires on the enemy while General Ross spots. Later, the Major is momentarily occupied and I took over the guns briefly during a critical moment. The enemy cavalry was approaching and I planned to wear them down with artillery fire then ride over the remnant with my cavalry reserve. 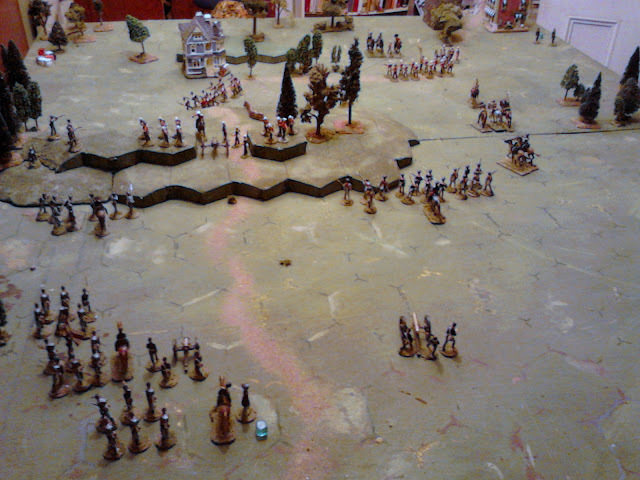 Another plan down the tubes, when the smoke and dust cleared not a man or horse survived for my eager troops to charge! At last came the main event, well for me anyway, my Fort MacDuff game. Might have been nice if I'd brought my camera or even if I remembered more often to haulout my phone but there we are. I don't think it looked much different from the playtests despite the table being 50% larger than anticipated. I planned for 6 players with provision for 2 more and I ended up with 7 excellent players who made running the game a pleasure. We were interrupted briefly by a ribbon presentation for the judges choice for that time slot which was gratifying even before I found out that it came with the means to bring home a few extra 40mm figures. Photo snitched from the Huzzah facebook page. The game itself was hard fought and nearly turned into an American victory with all redoubts captured and 2 guns spiked but a lone unit of Indians managed to buck the odds and throw the Elite company of Regulars out of the 3rd redoubt before the guns could be spiked and a large force of militia got trapped by Indians and mauled. The lines of retreat weren't blocked though and many of the militia would have have made it to the fort so it was a better outcome for the Americans than the original battle even though not an outright win. On Sunday morning I ran an impromptu re-run of the game since Jeff was signed into a HUGE 28mm Black Powder Leipzig. I ended up with one player, Scott, a long time member of the Yahoo LittleWar's goup . I teamed up with his young son, Niemy, who was a good reliable commander and excellent die roller and despite a bit too much enthusiastic chit chat about toy soldiers from the two older players, he persevered and together we squeaked out a narrow US victory over his Dad and the Brits. And there we are, all the welcome socializing and cross fertilization of ideas, gawking at what others are doing, buying of this and that and rolling of dice was done for another year. All that remained was a drive back to New Brunswick, arriving as dusk turned to night, a good sleep, a feed of thick locally cured bacon and waffles swimming in real maple syrup and off home to make it a 1,000 km round trip. Of course I was greeted by news that while I was gone, the septic backed up again, oh dear! Good thing there are Stout Hearts on the home front! Another urgent chore for me, Home sweet home! lots more good pictures there of the convention. Who nurtured my love of toy soldiers and history as well as everything else, and the 7 gentlemen gamers who made it such a pleasure to run the Fort MacDuff game. I'd also like to thank the Huzzah team for all the hard work they put in organizing such a great event, and for the shiny ribbon. Huzzah! Huzzah! Boots and Saddles! Sound the Long Roll! Well, I'm off in the morning. 3 of us in a car packed with troops and terrain, heading South for the spring! If you're in the neighborhood com'on down! looks like a good selection of games to be played and some options for spending money. I'll be running the Fort MacDuff game Saturday night and am sincerely hoping someone will come play, having some Blog readers or Battlegames Magazine (now joined to Miniwargs) readers join us would be even better. I've made provision for extra players in the unlikely event that the game fills so if you've read this just drop by and say "I've heard MacDuff has crossed the Frontier" and I'll slip you in! The game is only listed for Saturday but if I get 2 or more people committed for Sunday I'm sure they'll give us room to play. Another shot of the last playtest. The edge of the forest seems to have been trampled into oblivion during the battle or perhaps the Ents shepherded the trees away from harm. If you do stop by here once in a while, don't be shy, step up and say hello even if its just in passing. Look for me (hopefully) in the FLW game Saturday afternoon and likely in a 40mm something in other slots or wandering about. Oh and don't look for last year's Druid, my wife caught me walking through her grooming shop when no dogs were in so I've been well trimmed. Won't promise any remote blog posts from on the road but normal blogging will resume after the weekend with some thoughts on plans for this year and on finally getting the first of last year's hoped for mini-campaigns under way.